"A very refreshing drink. You may also use cantaloupe or honeydew melon. These taste like the juices served in authentic Mexican restaurants. Serve in tall glasses over ice." Combine 1 cup water, watermelon, and sugar in a blender; process until smooth. Pour into a large pitcher; stir in lime juice and remaining 7 cups water. Taste; adjust sugar or lime juice. Refrigerate until chilled, about 1 hour. See how to make the ultimate summer refresher. So refreshing! Definitely needs to adjust the sugar, depending on how sweet your melon is. I will make this again! I saw a note in Family Circle where you could sub 3 T of agave nectar for the sugar. Stir in 2 sliced limes. This was particularly great chilled! Excellent! 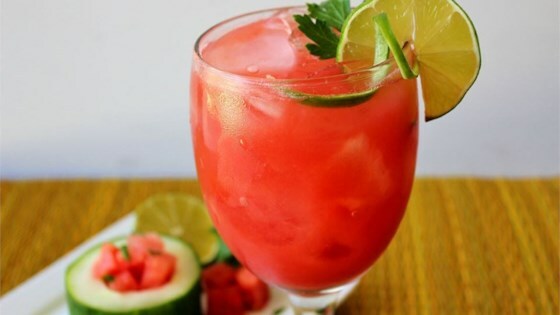 I can buy fresh watermelon juice by me and plan on making this on a regular basis.